Andrew Carnegie Elementary School is named after a man who donated much of his fortune to work on behalf of world peace, the improvement of teaching, and the construction of public libraries. In 1901 Andrew Carnegie sold his giant Carnegie Steel Company. Interest from his share of the sale price would bring him no less than 1 million a month for life. What did he do with the money? He gave it all away. During the last eighteen years of his life he gave away nearly $350 million dollars. Carnegie thought that men who became rich were very special people. Like the tiger in the jungle, they were the strongest, the quickest, the most intelligent. That was why they were rich. But they should not keep the money for themselves. That would be selfish. They owed it to the rest of humanity to make the world a better place in which to live. By giving away their money carefully, rich men could make a better world. By the year 1900, Carnegie was master of the United States Steel Industry. He could make steel at lower cost than anyone in America or Europe. He had helped establish the United States as the largest producer of steel in the world. And it was steel that made the United States the leader among all the world's industrial nations. 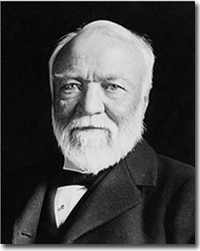 Just then, at the peak of his success, Andrew Carnegie retired. In 1901 he sold all of his properties to J. Pierpont Morgan and a group of men who had founded the United States Steel Corporation. The sale price was almost half a billion dollars. Carnegie did not give money away to just anyone. If he had simply distributed his money among the poor, each person would have received only a few cents. Instead he gave with great care. He helped, for example, to pay for twenty-eight hundred libraries in the United States and the British Empire, at a cost of $60 million. He also gave millions to the American British Universities. He directed his gifts mostly to smaller, less well-known schools not the schools of the rich, He wanted the children of the poor workers to have a chance for a college education too. Carnegie also gave large amounts of money for pensions for teachers and for his steel workers. He gave money for a college in Pittsburgh--Carnegie Institute, which was to be especially concerned with science. He made possible the Carnegie Hero Fund, which gave medals and sometimes cash for bravery in time of peace. Finally, he gave $125 million to the Carnegie Corporation of New York to carry on his work after his death.